These little dress is adorable. The waist measurement on this Dress is approx 6 3/4", it does have a bit of stretch in it, and the outfit is approx 4 1/2" from neck to tail. Along with the outfit we will send you a sheet on how to adjust the size a bit, how to care for the item and how to teach your rattie to wear the items. KEEP SHOPPING, WE ONLY CHARGE YOU SHIPPING ON ONE ITEM PER ORDER! This line of products is dedicated to the ratties that were rescued from becoming snake food.....and for owners with a keen sense of humor. However, any rattie would love to own these items. 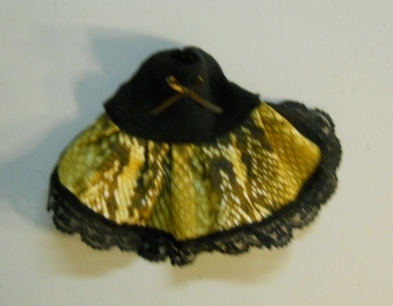 I use snake and cat print fabrics to make up items for rattie comfort. I have written a little HaHa Snakey poem and hope you get a laugh out of it.